The El Gallo Organic Breakfast Blend was blended and roasted for you by Intelligentsia Coffee. Coffees from Nicaragua and Ethiopia were carefully chosen and blended together. Created as an organic certified counterpart to their standard House Blend, El Gallo has a round mouthfeel with a smooth, candied sweetness. Flavors of citrus and stone fruits meet hints of creamy nougat and caramel, making a thoroughly enjoyable first cup of the day. I received the black cat espresso roast. Not this. This was ok. Not bad. Not amazing. Just ok. It was way to citrusy for my taste. Light roast, not bitter. Delicious and strong. Makes a perfect cup to wake up to in the morning! it was very good well balanced. Is it possible to have the coffee ground instead of whole bean? had an earthy musky smell that as a smell wasn't le any other coffee I've had wasn't appealing, but the flavor was surprisingly good, distinctive and pleasant. This is my first higher quality coffee so maybe the rating is inflated but i loved it. I normally do not drink coffee black and it was smooth and super tasty. Off to a great start!! great light taste. tasting right after brew, reminds me of fruit leather. very smooth and light-medium body. responds well to a touch of cream. getting the caramel with a slight citrusy aftertaste, after adding the cream. some sweetener added, but not even needed. will try not adding sweetener next time. just brewed my first cup this morning and overall very pleased. A little more citrus than I prefer, but otherwise it was good! Intelligentsia roasted and blended the El Gallo Organic Breakfast well, but I didn't like it personally. To my palette, the citrus was very strong even with tinkering with my brew ratios and water temps. Very acidic - perhaps too much so for me. Others looking for a bright, acidic, citrus blend may love it. Really enjoyed it, very smooth and a great cup to start the day with. The overall the coffee was less flavorful than anticipated. 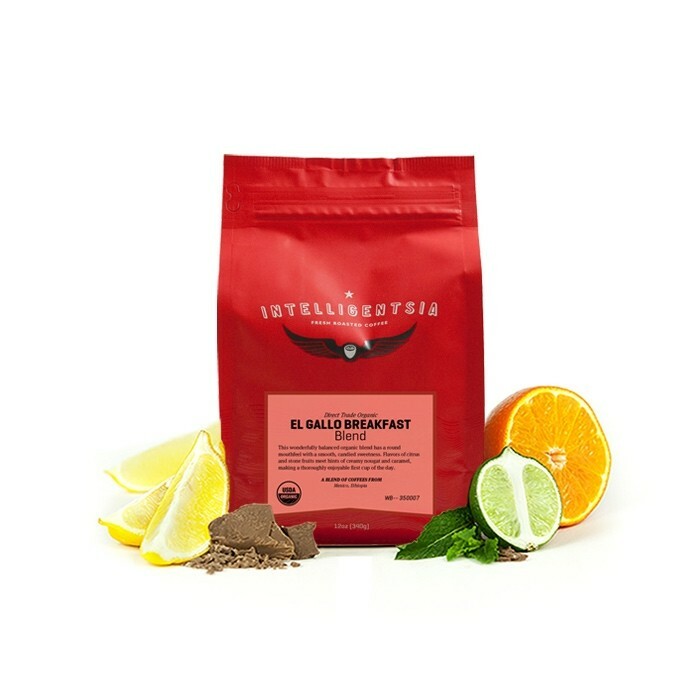 The citrus flavors hit the tongue at the beginning, but there was a bit of an almost earthy aftertaste we didn't enjoy I've had Intelligentsia before, and I liked this blend less than the previous one. It was a safe first coffee. Okay, but not incredible. My all-time favorite coffee was an Ethiopian roasted by Mad Cap in Grand Rapids. I'm open to blends, but single origins tend to be my favorite. Nicely balanced morning brew. The citrus added a refreshing element to the full coffee flavor. Smooth and balanced but not as complex as I would like. did not like , to strong , flavor not there for me. I like a little less citrus in my coffee.